Sam Querrey continues to feel right at home in Los Angeles, winning his 11th straight match at the Farmers Classic. Belgium's Xavier Malisse came into his match with Sam Querrey playing well in Los Angeles, yet he succumbed to a knee injury in the second set. 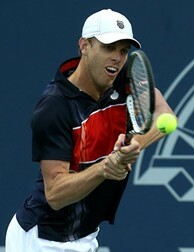 LOS ANGELES (AP) -- Two-time champion Sam Querrey ran his Farmers Classic winning streak to 11 on Friday night, taking a 6-2, 3-1 lead before fifth-seeded Xavier Malisse of Belgium retired from their quarterfinal match because of a right knee injury. Querrey, the 2009 and 2010 winner who missed the event missed last year because of a right shoulder injury, will face fellow American Rajeev Ram on Saturday night. Ram advanced to his second ATP Tour semifinal in three weeks, beating third-seeded Leonardo Mayer of Argentina 7-6 (3), 6-3. In the other semifinal at the Los Angeles Tennis Center, sixth-seeded Marinko Matosevic of Australia will play Lithuania's Ricardas Berankis. Berankis beat fourth-seeded Nicolas Mahut 6-4, 6-4, and Matosevic topped 34-year-old Michael Russell 6-2, 6-3. Cheered on by a large group of family and friends, the second-seeded Querrey used his big forehand groundstrokes to get an early service break en route to a 4-1 lead in the opening set and won 19 of 20 first-serve points in the 36-minute match. "I'll have to serve well and return well," Querrey said. "He's got a great serve. He plays a little different, some serve and volley and a lot of backhand slices. I'll have to be patient and hopefully return well off his serve." Ram won his only title in Newport, R.I., three years ago - beating Querrey in the final - and hadn't reached another semifinal until three weeks ago in Newport. "It just didn't happen overnight," Ram said. "I kind of re-evaluated my tennis. Not like, 'Do I want to keep playing?' but just how I was going about it and trying to make improvements. I felt like I was giving too many points away, both mentally and by going for too much, and (needed) just to find a way to make more guys beat me. If a guy beats me by hitting more winners, then he beats me." Berankis, the No. 1 junior in the world in 2007, missed four months last year and three months this season because of a stress fracture and torn muscles in his pelvis. Playing only his second tour event of the year, he beat seventh-seeded Bjorn Phau in the first round and Igor Andreev in the second, and hasn't lost a set. Against Mahut, the ninth game of the first set went to deuce nine times before Berankis converted his seventh break point for a 5-4 lead. "For the first set, I think for sure that was the crucial game," said Berankis, who occasionally trains with Roger Federer. "I somehow managed to break him. Maybe there were a couple of lucky points for me, but I was happy the way I could control myself and not let my emotions control me." That break led to another break to open the second set. "I think that was still (a carryover) from the first set," Berankis said, "because he was kind of down and I guess he couldn't control himself emotionally. He made a couple of bad unforced errors in that game. I just hope that tomorrow I can continue the way I'm doing now, the same game I'm playing now."